Adding Interest to the Stacks: 8041 soup bowl in Sundowner for GALLERY. 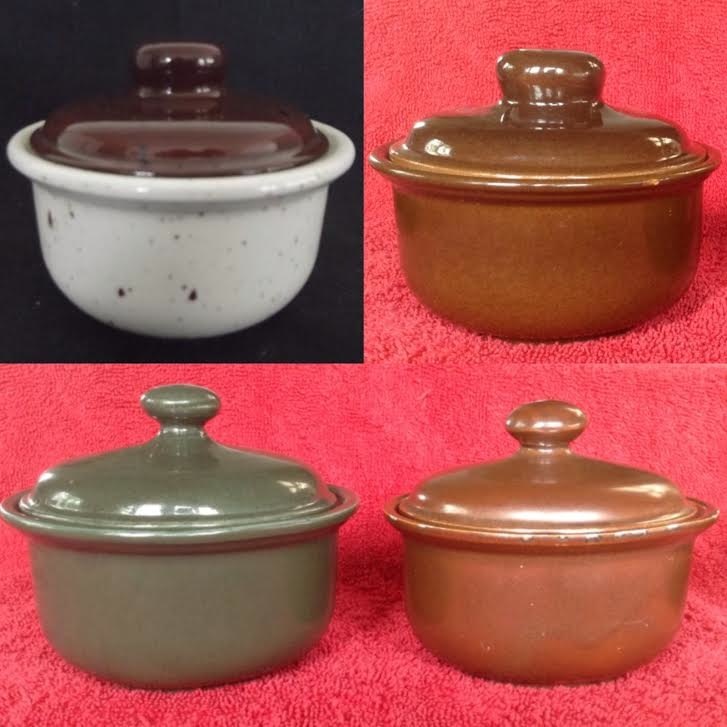 Adding Interest to the Stacks: Now looking for 8041 soup bowl in Pioneer or Sundowner. These are my kitchen stacks of 5620s and "soup bowls". I have more Pioneer 5620s in storage. I keep the fancy ones at the bottom usually. I have two new additions to the bowls. These are slightly beefier than the Pioneer so it's tidier with them at the bottom. The Air New Zealand and the "Navy". I can't decypher the "Navy" monogram. These two were sold as "Navy". As seen, no base markings. They have a slightly heavier base ring than either Pioneer or Air New Zealand. and probably should have bought it but it had a nasty mark inside. Following Ev's comment below I checked the insignia and it is indeed identical to the RNZAF one. Thank you Ev. So yes, they are Air Force, but I'll leave the text above alone. Re: Adding Interest to the Stacks: 8041 soup bowl in Sundowner for GALLERY. It's a bit hard to see that insignia, but it looks like the Royal New Zealand Air Force. Gosh I should be able to find numbers for those vitrified shapes when I get time, especially the Air NZ one !!!!!!!! A swap with Jim gives me this. Blue Tango 1966 for Gibsons and Paterson. The addition of the Blue Tango bowl now gives me six different bowls, not counting variations on the Pioneer/Redwood glaze and their various backstamps. 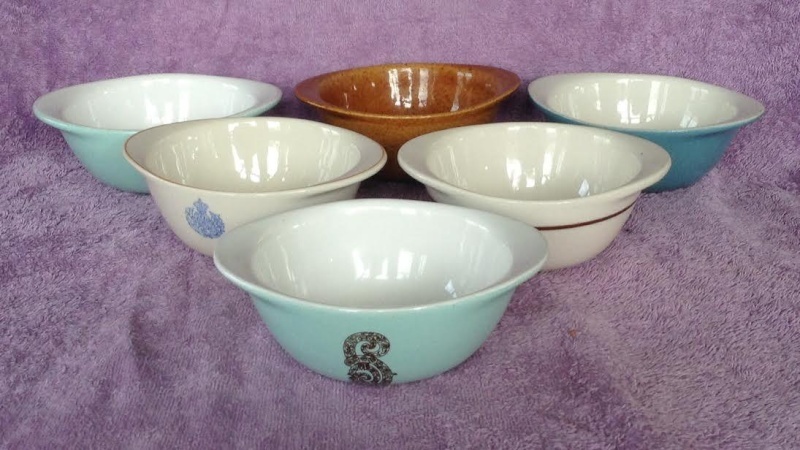 Back left is either a DC8 Tahora bowl without the brown glaze (Tahora pattern and backstamp) or simply a DC8-teal-coloured bowl. It is the same size as the DC8 and is the only other bowl here with an impressed New Zealand mark. Is the RNZAF bowl actually an 8641? I'm good with the Air NZ as 5610 as the date works with it being the first 56xx. The plain teal in the previous post is, I think, just an Air NZ without Tahora. Both have "New Zealand" impressed mark. 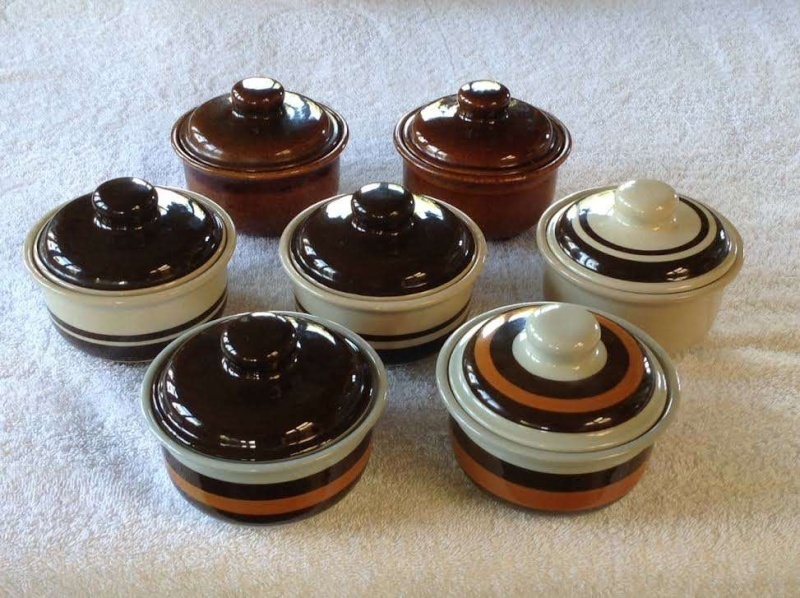 The brown ("Pioneer") Cook and Serve ones would have followed the blue Gibsons and Paterson which is dated 1966. No impressed mark. Slightly lighter weight than the teal ones but blue and brown are essentially the same shape. Remodelled 5610? The THC and RNZAF are beefier and have a sturdier footring. Minor variations between the two but essentially the same. These then are likely 8641. I thought we already had two numbers for these but have only found one item in the gallery. Exceptional work Jeremy as this number was overlooked some how when I added descriptions to the Gallery. Now to decide if we should use your Airforce bowl for the 8641? My suggestions for three distinct shapes are above. If you are happy with them then go ahead. I edited my previous before I went out and forgot to send. 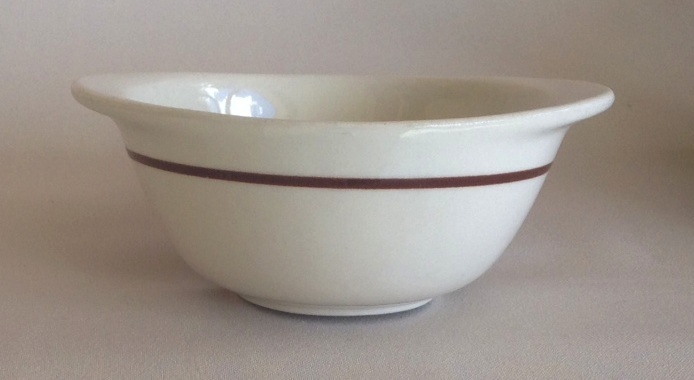 The brown bowl was inadvertently posted at 8-0-41 in the gallery. but consistent with my RNZAF. I will have to come back to this Jeremy, as I need to put my chef's hat on right now. So we have numbers for 4 of these bowls don't we and at least one is Earthenware ... right? I am not aware of any in earthenware. I only know of the two numbers: 5610, 8641. On closer inspection of the tm listing I see the one in the box top left has the monogram like mine where the wreath and letters bleed together. Also, you get a view of the bases showing the heavier rounded footring, quite unlike the Cook & Serve but a match for my RNZAF. So I'm good on Air NZ for 5610. I'm good on RNZAF for 8641. The date on the Tango-Blue/Blue-Tango Gibsons & Paterson (1966) tells me it is to early for 8641. The Cook & Serve are a shape match for the Gibsons etc thus (unless there are any other numbers) I sticking with them being a remodelled 5610. The 5610 Gibsons etc would have been THC North Island Blue Tango. The 8641 THC would be its replacement when THC changed their pattern from Tango to brown line decoration. 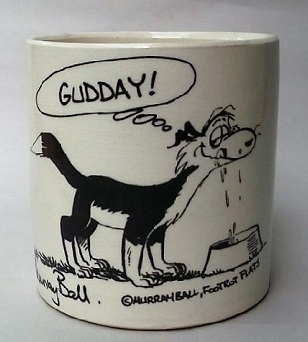 So now I think the 8041 is incorrect as it is a Cook & Serve and not Earthenware. The 8041 has me stumped Ev. What I have is either marked Cook & Serve or it is airline/hotel/cafeteria ware so will all be vit. I thought the 8041 was a mistake that was intended to be 8641 but if you have taken it from CL papers then I can't question it, but I do agree that the Cook & Serve bowl is not appropriate for that number. Jeremy I found the 8041 Soup Bowl in a 1981 Price List for Pioneer. Lets hope someone has one that matches their Pioneer pieces. I'll have to check through my Pioneer-looking bowls (could be 10+ of them) to see if any do not have stamps with Cook & Serve or whatever Airline may have used them. Then, if I find one, I'll have check to see if it is earthenware rather than vitrified. The unglazed bases are getting a bit murky because they are in regular use. Another thought. Does the description for the 8041 refer to them having lugs? We could be dealing with a different shape entirely. 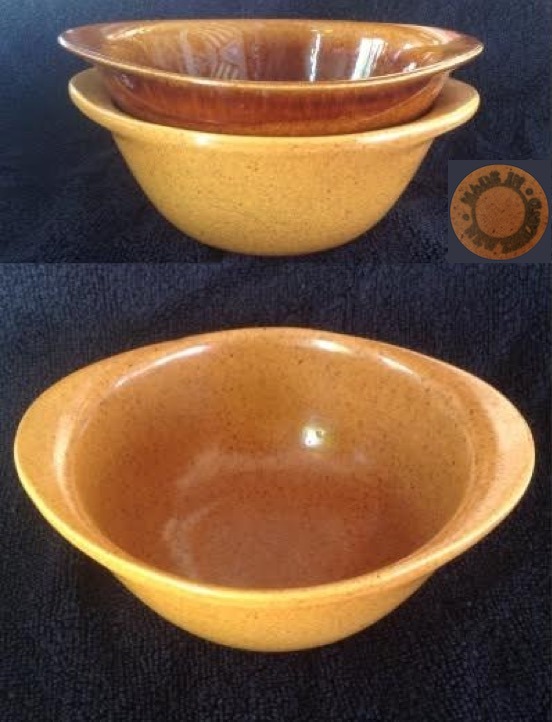 Maybe the description as "Pioneer" pattern just led to an assumption that it was the lugged bowls. The description for the 8041 is "as 5610" so they are definitely the same bowl. I have a few photos of large displays of Pioneer and will check them out sometime. I have since found another pattern that has the 8041 Soup Bowl and that is Sundowner, from the same 1981 Price List and again I have pics of displays of this also somewhere. I have seen the Sundowner ones for sale on tm. Yet to scrub my "Pioneer" bases. Might be easier to tap them. I'm just taking a breather after having the gang around. 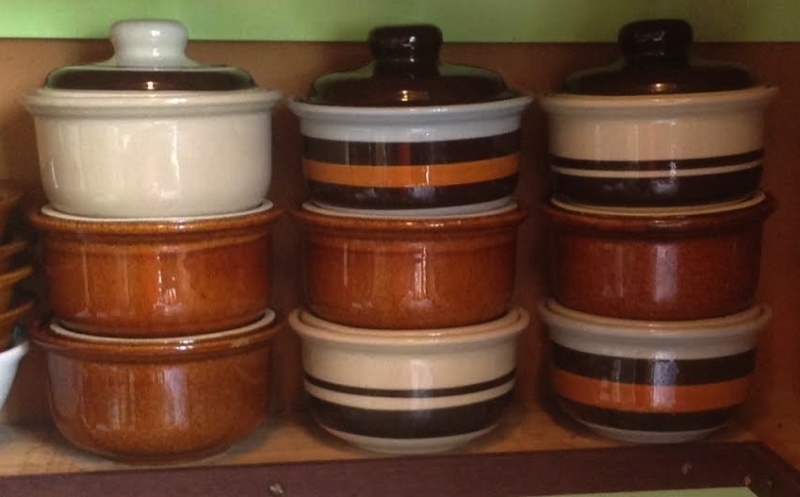 All my bowls with the Pioneer-coloured glaze have Cook & Serve backstamps. The earlier of two different stamps is consistent with 1960s Cook & Serve as seen on coffee can saucers (shape #792) and is stamped on an unglazed base. The later, of which I have just one example has a glazed base and updated stamp with altered flames, fonts, and "Crown Lynn" omitted. 8041 earthenware soup bowl in Sundowner. Basically same size as the vitrified ones but a whole lot thicker in body as can be seen in the comparative photo.